Once a staff member has been given access to your account, you can control what areas of the account they have access to. Our How to give staff access to your account guide takes you through the process of giving a staff member access. Choose if a staff member can see their own Personal calendar or have access to All calendars for staff. You can then determine if they have View only access, or if they have full access, which will allow them to add and edit appointments. If you work with contractors, or don't want staff to see your prices, then you can choose to hide pricing. This will include the calendar, in the customer's record and in any notification emails. To further protect customer privacy, contact details can be hidden too. As administrators don't have their own calendars, they will have more limited controls e.g. they can only view All calendars or No calendars. Choose which Dashboard views the staff member can access and whether this includes just their information, or data for All staff. The Business overview which shows sales and productivity performance (Find out more). The Staff overview which outlines individual staff performance e.g. Sales, bookings and retention (Find out more). The Activity dashboard which shows upcoming appointments, pending appointments and recent history (Find out more). 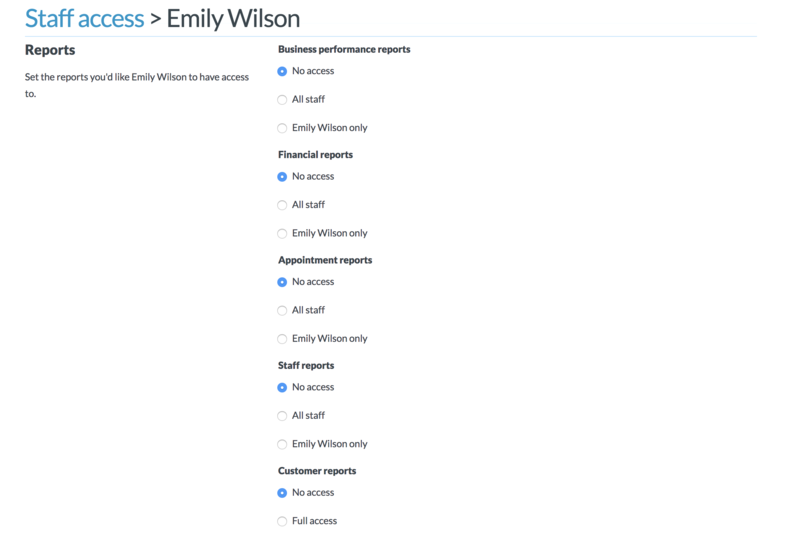 These settings determine if staff can access the Sales area, or view or raise invoices. This will include the ability to issue and redeem gift vouchers. 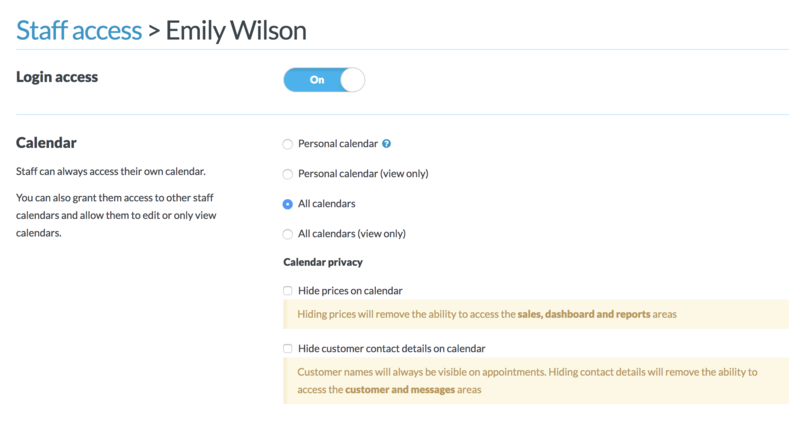 If prices are hidden from the staff member (see Calendar section above), then this section will automatically be hidden and staff won't be able to raise or view invoices. If you have Cash management enabled, then you will also see some additional options here. You can allow staff to record petty cash expenses and/or allow them to perform a cash up at the end of the day. Grants or revokes access to the Customers area and hides customer contact details and related reports. If you have chosen to hide the customer's contact details from this staff member (above), then access to the customers will automatically be removed. Check these options to let staff access the Messages area and see outgoing messages, replies or both. If you have chosen to hide the customer's contact details from this staff member (above), then access to the Messages section will automatically be removed. Check out our Getting started with Timely reports guide for more information on which reports are included in each category. Setup includes anything under the Setup menu i.e. Your business, Sales tools, Notifications and Administration. You can choose to give a staff member access to only their Roster to allow them to update their own availability. Access to the Promote tab can be given independently - perfect for website developers and designers. Giving someone access to the Account tab will allow them to view your billing information, payment history and account invoices. It will also allow them to purchase SMS credits.